"Mix Larry Sultan and Mike Mandel's Evidence with some of Cindy Sherman's Film Stills, add a whole lot of Joan Fontcuberta, print the results on the cheapest paper you can find and you'll still be a million miles away from Koen Hauser's latest book, De Luister van het Land. Koen Hauser specializes in strange manipulations; of children, anatomy models, archive pictures and himself. 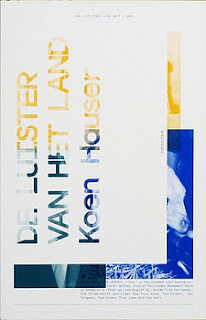 For De Luister van het Land, Hauser was let loose on the 11 million images of the Spaarnestaad Photo Archive. Free to roam the archive, Hauser becomes the master of our imaginations, manipulating himself into the archival narrative to make images that Hausers labels performance, images intended to 'invoke the spirit of creation.'" Read the rest of the De Luister van het Land review in photo-eye Magazine.